Why haven't I heard of this type of chiropractic care before? How do I find an Upper Cervical Chiropractor? How long has Chiropractic care been around? I feel fine. Could I still have sublaxation? How does a Subluxated spine affect children? Can a person who had back surgery see a NUCCA Chiropractor? NUCCA stands for the National Upper Cervical Chiropractic Association, and is a specialty within the chiropractic field. Drs. John Grostic and Ralph Gregory collaborated to develop a more accurate bio-mechanic system of upper cervical correction. NUCCA is a gentle and safe form of chiropractic care, with a focus on permanent results. The NUCCA procedure was designed to correct the entire spine back to a balanced unstressed position. This repositioning reactivates the transmission of healing messages from the brain to the affected part of the body (via the nervous system) so the body's natural self-healing process can begin. We make a gentle and controlled correction behind the ear (1st bone in the neck - atlas) to restore balance to the spine. Even though the primary focus is the neck, the effect of the correction influences the whole spine and all body systems. This is because NUCCA influences one of the highest control centers over body balance - the brain stem and the central nervous system! Unfortunately less than 5% of the Chiropractic profession has the proper training to use this procedure. That means there are approximately 2000 Chiropractors worldwide that use this type or similar procedure. There are over 250 different types of Chiropractic techniques available, all of which get results. However, our doctors have chosen the NUCCA Procedure as the most effective means of helping their patients. The earliest records of spinal manipulations are found in ancient cave drawings dating back to 17,500 B.C. The ancient Chinese were using spinal manipulations in 2700 B.C. Modern day chiropractic was founded in 1895 by Dr. Daniel David (D.D.) Palmer who "rediscovered" chiropractic care. Dr. Palmer had an opportunity to observe a janitor who had been partially deaf for 17 years. The janitor advised Dr. Palmer that he had been stooped over when he had felt something 'give' in his back. Since then he had suffered hearing loss. Through a chiropractic adjustment the janitor regained his hearing. Modern chiropractic was born! The Palmer family founded the Palmer Chiropractic College in Davenport Iowa. Palmer College today remains one of the premier chiropractic colleges in the world. The word chiropractic is derived from the Greek words "cheir" and "prakitis", meaning done by hand. Chiropractic is based on the principle that the body has an innate power to maintain its own health. Chiropractic focuses on the correction of nerve interferences within the spine called subluxations. Science has found that the nervous system controls all organs and tissues of the body. If there is an interference with the proper functioning of the nervous system it would seem logical that the body is not able to fully maintain its own health. My doctor tells me that I have a vertebral subluxation. What is that? Defined by the Association of Chiropractic Colleges, a subluxation is: "a complex of functional and/or structural and/or pathological articular changes that compromise neural integrity and may influence organ system function and general health,." Simply put: A vertebral subluxation means that the bones in the spine are not properly aligned, which causes changes to the structure as well as the nerves. Over time these changes can get progressively worse. This ongoing degeneration is known as "subluxation degeneration". Proper chiropractic care can help prevent further subluxation degeneration. The spinal column remains straight and balanced as long as the weight of the head is centered over the neck. When the weight of the head is shifted off center, due to an accident or injury, the body will compensate and move into an imbalanced position. In an effort to keep the head centered over the neck, the spine and pelvis will twist and lock into a stressed position. This body position can cause stress, tension and pressure on the entire nervous system, most importantly the brain stem (base of the brain). This is very important because our body shuttles millions of electrical and chemical impulses back and forth from the brain to every cell of our body each day. Any restriction or distortion of those messages (nerve impulses) can affect every body function. When this continues over time, something else starts to happen. Because nerve flow is disrupted or distorted, degeneration of cells in organs can occur, causing internal physical problems that may not show up for years. I feel fine. Could I still have a Subluxation? Yes, sensation is conveyed from the body's sense organs through the spinal cord to the brain over the sensory or input nerves. If the Subluxation reduces the capacity of these nerves to carry sensation, the patient will not be fully aware of his/her health problem. One may feel well enough, but be quite ill. When we are young we are not as susceptible to the structural problems but we may have more of the nerve-related functional problems. Chronic ear infections, stomach aches and leg cramps (growing pains) may be the first signs to appear. These may be followed by chronic respiratory problems such as allergies, bronchitis and asthma. Many of the learning disorders and behavioral problems may also be related to the subluxated spine. The distress to the brain stem may affect the ability to focus attention, to comprehend and process information. As soon as possible after birth a newborn should be examined to determine if they have a subluxation. Newborns have received spinal adjustments especially after difficult or traumatic births. As you child grows and develops, bumps and spills that are a part of childhood can cause the spine to be subluxated. Sometimes it is the teenage years of sports and rough and tumble activities that can cause a subluxation. The safest approach is to have your children checked, and you can be assured that our doctors will not administer care unless it is truly indicated. Chiropractic is among the safest of the healing arts. As proof, one merely has to compare malpractice rates between Chiropractors and other health professionals. Chiropractors' malpractice premiums are a small fraction of those for medical doctors, especially orthopedic surgeons. 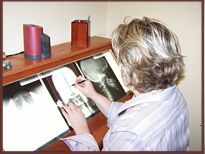 The x-rays we take help the doctor to obtain a specific "key" to unlock the misalignment of your spine. Having the proper information keeps the doctor from guessing with your health care. We take only the necessary views needed to accurately analyze your problem. Our x-rays are taken with high-speed film. This means less exposure is required for each view. You will not have x-rays taken until the doctor determines that you could benefit from NUCCA care. The doctor uses principles of engineering, mathematics and physics in analyzing each x-ray in order to ensure the best possible correction for each individual patient. 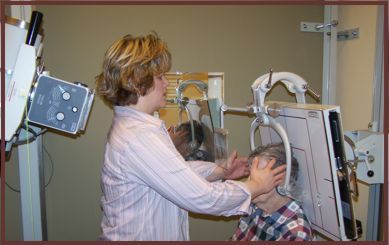 Post x-rays are taken after the first adjustment as a means of determining that the adjustment is correct. This is normally done only after the initial adjustment. Yes. It's an unfortunate fact that up to half of those who had back surgery discover a return of their original symptoms months or years later. They then face the prospect of additional surgery. This too common occurrence is known as "Failed Back Surgery Syndrome." Chiropractic may help prevent repeated back surgeries. The Atlas correction is safe for patients of all ages and with most all conditions. There is no twisting, popping, or forceful adjusting of the spine. Rather, a gentle spinal correction is given to correct the misalignment and restore Body Balance.